It’s been almost three weeks now since release and I’ve had tons of great conversations with many of you on how to improve the sequel. Once again I couldn’t resist the urge to implement some of these things to make Underworld better. While some things will indeed have to wait for the next Swords and Sorcery installment, a good deal of these are now in Underworld. Gold, food and water are now party ressources. The figures are global. (G)athering and (S)haring have been removed from the game entirely. Stores have been overhauled as well. Characters and store “aisles” can now be changed without stepping out. Buying weapons (now “Arms”), armor, imported and miscellaneous items can be accessed via function keys (F6-F10) while F11 switches to selling mode. F12 switches to description mode, no matter what part of the store you are in. Arrow keys and 1-6 switch characters while staying in the same mode. – SP (blue), Holy Water and Runes (purple) meters added to character list in world view and combat. – Increased mouse and keyboard responsiveness. – Popup info screens explaining when Ste(a)lth is disabled and why (Rogues need full HP) and other less than evident restrictions. 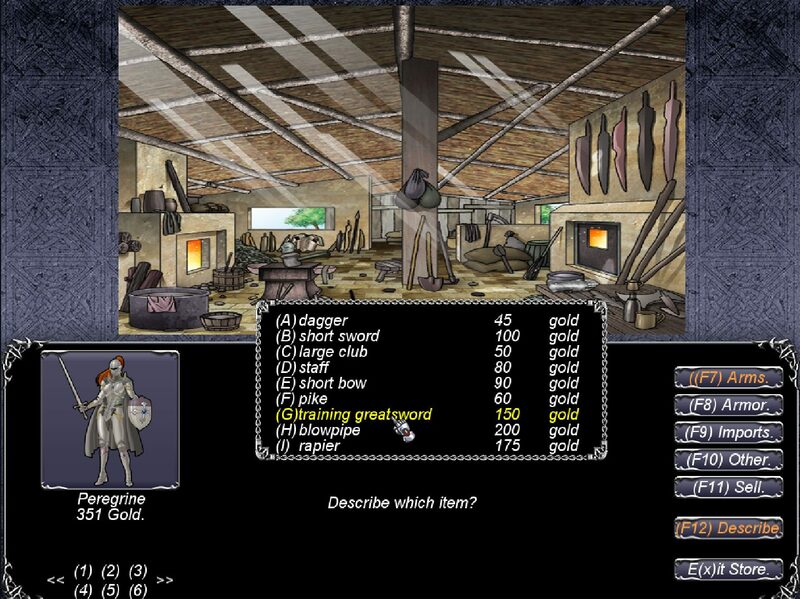 – Added clues for some of the game’s more cryptic situations. – Options accessible from the intro screen. – Skill descriptions accessible in character status screens while in combat. 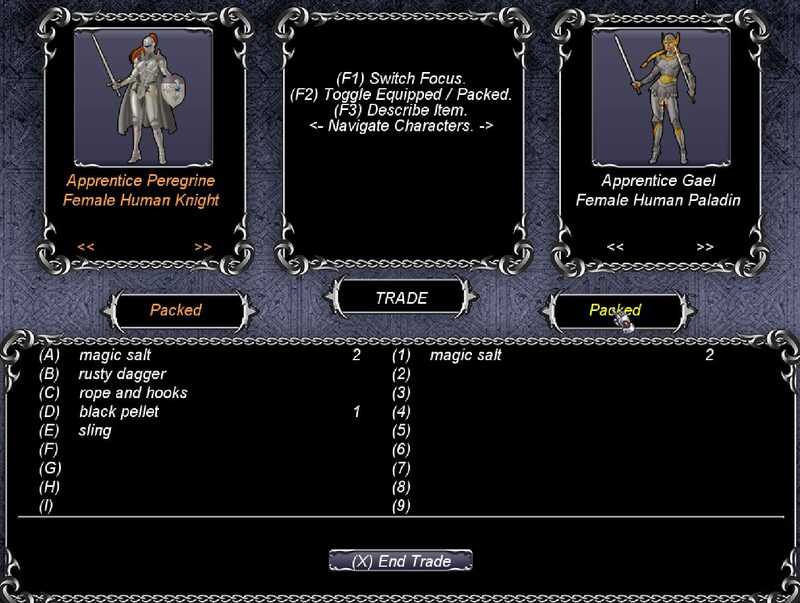 – Attributes described in game (accessible in character creation and status screens). – Offensive spells no longer require selecting that last enemy. – Ammended AI for shooters. – Fixed several incomplete item descriptions. – Added entries to Quest Log. – An important item drop not occuring in certain circumstances. – Seeing rebels before seeing the king caused improper response. – Fixed “Silenced” on Fire Spirits and enemy healers. – Fixed items wrongly flagged useable that caused a freeze when used. – Fixed damage and distance calculations. – Fixed missing walls in River of Fire. – Fixed “A”ttack Necromancer causing the Rogue to enter ste(a)lth if first up. – Fixed World Map (Now hotkeyed ‘W’) that made the goblin realm selectable when it shouldn’t have been. – Fixed menu hotzones for mouse (that were too low). My initial plan was to release a bug fix update but the other changes caused a considerable delay in its release. My apologies and thanks to all of those who have been patiently waiting for it. Big, big thanks to players that have reported bugs and suggestions in the forums! Please check your emails for the update link. If for some reason you didn’t get it, don’t hesitate to ask for it at charles at this-website-url (olderbytes) dot com. Next up, the sequel announcement. Just a few days now!